​September 1976, the Marcoses bought their first property in the U.S. – a condo in the exclusive Olympic Towers on Fifth Avenue in New York . Five months later they would also buy the three adjoining apartments, paying a total of $4,000,000.00 for the four and using Antonio Floirendo’s company, The Aventures Limited in Hong Kong, as front for these purchases. July 1978. After a trip to Russia, Imelda arrived in New York and immediately warmed up for a shopping spree. She started with paying $193,320 for antiques, including $12,000 for a Ming Period side table; $24,000 for a pair of Georgian mahogany Gainsborough armchairs; $6,240 for a Sheraton double-sided writing desk; $11,600 for a George II wood side table with marble top – all in the name of the Philippine consulate to dodge New York sales tax. After New York, she dropped by Hong Kong where a Cartier representative admitted it was this Filipina, Imelda, who had put together the world’s largest collection of gems – in 1978. November 23, 1978 A house was purchased at 4 Capshire Drive in Cherry Hill , New Jersey (actually near to Philadelphia where Bongbong was taking courses at that time) for use by servants and Bongbong’s security detachment. The Marcoses did not neglect their annual real estate purchase. During this year and next year, 1979, they purchased two properties – one at 3850 Princeton Pike, Princeton – a 13-acre estate for use by daughter Imee as she attended Princeton. The other was a house at 19 Pendleton Drive in Cherry Hill for use of Bongbong and under the name of Tristan Beplat, erstwhile head of the American Chamber of Commerce in the Philippines . April 1979 in two days in New York this month, Imelda spent $280,000 for a necklace wet with emeralds and diamonds; $18,500 for a yellow gold evening bag with one round cut diamond; $8,975.20 for 20-carat gold ear clips with twenty-four baguette diamonds; $8,438.10 for 18-carat gold ear clips with fifty-two tapered baguette diamonds; and $12,056.50 for 20 carat gold ear clips with diamonds. February 16, 1986. In Fe’s records of monies paid out during Marcos’ last campaign, one unusually large item was authorized by “FL” (First Lady) and paid to Assemblyman Arturo Pacificador on this day. A few days later, two carloads of men drove into San Jose , the provincial capital of Antique. February 25, 1986. Marcos fled the Philippines leaving behind a foreign debt of $27 billion and a bureaucracy gone mad. “Cash advances” for the elections from the national treasury amounted to Php 3.12 billion ($150 million). The Central Bank printed millions of peso bills, many with the same serial number. Sixty million pesos in newly printed bills were found in a vehicle owned by Imelda’s brother Bejo in the Port Area of Manila, and another Php 100 million aboard the MV Legaspi also owned by Bejo Romualdez. How massive and humongous a loot Marcos took can be deduced from the known losses he left behind. The known losses he left at the Central Bank included $1.2 billion in missing reserves and $6 billion in the Special Accounts. 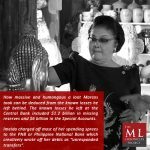 Imelda charged off most of her spending sprees to the PNB or Philippine National Bank which creatively wrote off her debts as “unresponded transfers”. Ver also used PNB funds to finance his “intelligence” operations. The known losses at the PNB amounted to Php72.1 billion. and at the NIDC or National Investment and Development Corporation (NDC) – the losses amounted to Php 2.8 billion. These losses were primarily due to cronyism – giving loans to cronies that had little or no collateral, whose corporations were undercapitalized, whose loan proceeds were not used for the avowed purpose, and where the practice of corporate layering was common, i.e. using two or more companies with the same incorporators and officers, whereby one company which gives the loan owns the company which obtains the loan, or similar arrangements. The cronies enjoyed their closeness to Marcos. With him they formed a Grand Coalition. They participated in the exercise of dictatorship. But Marcos owned them. The wealth of the cronies belonged to him. Because of the free rides taken by Imelda, Marcos and the cronies, the Philippine Airlines was in debt by $13.8 billion. The conservative Grand Total for losses Marcos left behind (and therefore the kind of loot he grabbed and hid) amounted to $17.1 billion. The Central Bank, the PNB, and other financial institutions badly need an audit. The special review (not regular audit because there seems not to have been any – there are no records anyway) did not uncover Imelda’s spending – her name never appeared – and Ver’s intelligence fund. The review gave no hint of theft or missing money, only “downward adjustments” and “proposed adjustments” to “deficiencies” and “shortages of money”. February 26, 1986. A few hours after the Marcos party landed in Honolulu, their luggage arrived – 300 crates on board a C-141 cargo jet. It took twenty-five customs officers five hours to tag the bags and identify the contents. The process was videotaped because of all the money and jewelry found inside. There were other certificates of deposit from Philippine banks worth about US$1 million, five handguns, 154 videotapes, seventeen cassette tapes, and 2,068 pages of documents – all of which were impounded by Customs. The Marcos party was allowed to keep only US$300,000.00 in gold and $150,000.00 in bearer bonds that they brought in with their personal luggage because they declared them and broke no US customs laws. February 1986. When Marcos departed the Philippines, the losses in the three Central Bank accounts surpassed Php 122 billion (more than $6 billion). The big bulk of losses was attributed to the RIR account mainly due to two items: forward cover and swap contracts. Forward cover referred to foreign exchange provided by the CB at a fixed exchange rate to importers of essential commodities. Swap contracts referred to CB’s receiving foreign exchange from banks in exchange for pesos at the prevailing rate with a promise to deliver the foreign exchange back to them at an agreed future date. There was no mention of losses due to CB transactions in gold or foreign exchange. February 28, 1986. On this day, Jim Burke, security expert from the US Embassy, was tapping on the wooden paneling in Imelda’s abandoned Malacanang bedroom when he heard a hollow sound. It was the walk-in vault. Inside were thirty-five suitcases secured with locks and tape. They contained a treasure trove of documents about Swiss bank accounts, New York real estate, foundations in Vaduz , and some notepaper on which Marcos had practiced his William Saunders signature. They also contained jewelry valued at some US$10.5 million. March 16, 1986. Did Marcos steal any gold from the CB? The CB always refused to comment. Why? Today, the LA Times reported that 6.325 metric tons of gold was unaccounted for in the Central Bank. Between 1978, the year Marcos ordered all gold producers to sell only to the CB, and end 1984, the Bureau of Mines reported that 124,234 pounds of gold were refined. But the CB reported receiving only 110,319 pounds during this same period. That left a difference of 13,915 pounds (6.325 metric tons). March 1986. Jokingly referring to themselves as the Office of National Revenge, a vigilante team led by Charlie Avila and Linggoy Alcuaz received a tip in the morning that Marcos’ daughter Imee had kept a private office in the suburb of Mandaluyong at 82 Edsa. They obtained a search warrant, then rushed to Camp Crame to pick up some soldiers. After devising a plan, they boarded four cars and drove to the premises, arriving around midnight. The soldiers scaled a fence and sealed off the area. Avila , Alcuaz, and their men moved in and found documents in cardboard boxes, desks, and filing cabinets. Gunfire could be heard outside but it didn’t deter the search. The documents revealed the names of offshore companies and overseas investments of Marcos and his cronies – a late link in the paper trail that had been started abroad by the teams of Avila, Steve Psinakis, Sonny Alvarez, Raul Daza, Boni Gillego, and Raul Manglapus. March 09, 1986. A Greek-American, Demetrios Roumeliotes, was stopped at the Manila International Airport before he could leave with eight large envelopes stuffed with jewelry that he admitted belonged to Imelda – valued at US$4.7 million. Is it true that Marcos propagated the Yamashita myth to hide the fact that he looted the Central Bank, that its gold bars were melted down and recast in odd-size bars to make them look old (how does gold look old, anyway?). Marcos claimed that he “received the surrender of Gen. Yamashita” after a battle with his guerrilla outfit. History has recorded that Yamashita surrendered to Lt. Co. Aubrey Smith Kenworthy and that there was no battle. Yamashita’s peaceful surrender had been arranged at least two weeks before the event. The largest human rights case in history – 10,000 victims. Guinness Book of Records – the world’s greatest thief. The largest monetary award in history – $22 billion..
September 30, 1986. Questioned by Philippine and US lawyers about his hidden wealth, Marcos took the Fifth Amendment 197 times. Imelda followed suit – 200 times. December 1989. An American jury found the Marcos estate liable for $15 million in the killing of anti-Marcos activists Gene Viernes and Silme Domingo. Manglapus, Psinakis, Gillego and other erstwhile exile oppositionists testified at the trial. November 04, 1991. Today, a Sunday, the circus came to town. The Swiss Federal Tribunal had ruled the year before that the Philippine government must comply with the European Convention of Human Rights, especially due process. There had to be a lawsuit filed within one year. Thus, the solicitor general’s office filed all sorts of cases against Imelda and the government had to allow her to return to answer the charges. “I come home penniless,” she tearfully said on arrival. She then repaired to her suite at the Philippine Plaza Hotel which cost $2,000 a day and rented sixty rooms for her entourage – American lawyers, American security guards and American PR firms. December 1991. The Central Bank had accumulated losses of Php324 billion in the Special Accounts. November 30, 1992. The Central Bank losses were Php561 billion and climbing. Cuisia asked that the CB be restructured. Sen. Romulo asked to see the 1983 audit of the international reserves. He couldn’t get a copy. It was “restricted” . January 05, 1993. Imelda didn’t show up for the scheduled signing of a new PCGG agreement. She kept vacillating on the terms and conditions – demanding she be allowed to travel abroad for thirty-three days to confer with bank officials in Switzerland, Austria, Hong Kong and Morocco to work out the transfer of the frozen funds. Actually she was hoping a guy she had authorized, J.T.Calderon, would be able to move the funds just as the order was lifted, before the government had a chance to transfer them to Manila . When the government discovered the authority, all negotiations with Imelda were halted and her requests for travel suspended. A $356 million account (now in escrow and worth almost $600 million) which was being claimed by the PCGG. In 1994, the human rights jury awarded the victims $1.2 billion in exemplary damages, then $766.4 million in compensatory damages a year after that, for a total of $1.964 billion. Two days after, another $7.3 million was awarded to twenty-one Filipinos in a separate lawsuit. In 1995, the US Supreme Court upheld the $1.2 billion judgment. March 29, 1995. The Swiss Parliament passed a law (an amendment to a previous act) that removed the need for a final judgment of criminal conviction of the accused (such as the Marcoses) in the case of criminally acquired assets which could now therefore be returned to claimants (such as the Philippine government) by Swiss court order. July 1996. In part because of the torture of Roger Roxas, $22 billion was awarded to his Golden Budha Corporation. December 10, 1997. The Swiss Supreme Court promulgated a landmark decision that took into account the March 1995 Swiss Parliament act and the fact that new criminal cases had been filed against Imelda Marcos. The court held that there was no need for any criminal proceeding; that a civil or administrative proceeding would suffice, and the Marcos Swiss deposits which had been “criminally acquired” can be returned to the Philippines in deference to the final judgment of the Philippine court as to the ownership of these deposits. Philippines to be held in escrow account in the PNB to await the judgment of the Sandiganbayan in the forfeiture case. By the way, in January 17, 1975, a secret decree not made public until after the Edsa insurrection was signed by Marcos stating that in the event he became incapacitated or died, power would be turned over to Imelda. On June 7, 1975, in his own handwriting, Marcos amended the January 17th decree and clarified imelda’s role as chairperson of committee with presidential powers. In February 1979, Imelda was named chairman of the cabinet committee, composed of all ministries, to launch the BLISS (Bagong Lipunan Sites and Services) program, an ambitious attempt to centralize control of all economic and social development. She assumed responsibility for the “11 needs of Man” codified in her ministry’s multi-year Human Settlements Plan,1978-2000. By 1986, the number of Filipinos living below the poverty line doubled from 18 million in 1965 to 35 million. And the ecological balance of the country had degraded from 75 % to 27% forest cover remaining – with 39 million acres of forest falling victim to rampant logging. This was BLISS. She was also the head of the Metro Manila Commission, which by year-end 1985 had managed to accumulate debts of Php 1.99 billion (which included $100 million in foreign loans) in its ten years of existence. Imelda had accomplished nothing and left the people embittered and even more disillusioned. Imee and brother Ferdinand “Bongbong” Marcos, Jr. have been active in the political scene. Bongbong, who finished 3 terms as Ilocos Norte governor, is now running for Senator under Presidential bet, Manny Villar’s senatorial slate.. he’s been quoted as saying that if given a chance, he’d like to run for President one day…(gads) . Bongbong is now a Senator, Imelda is Governor of Ilocos Norte and Imee is in Congress. The MARCOSES are back in full force thanks to our “despicable amnesia” as aptly described by the eminent writer, F. Sionil Jose.